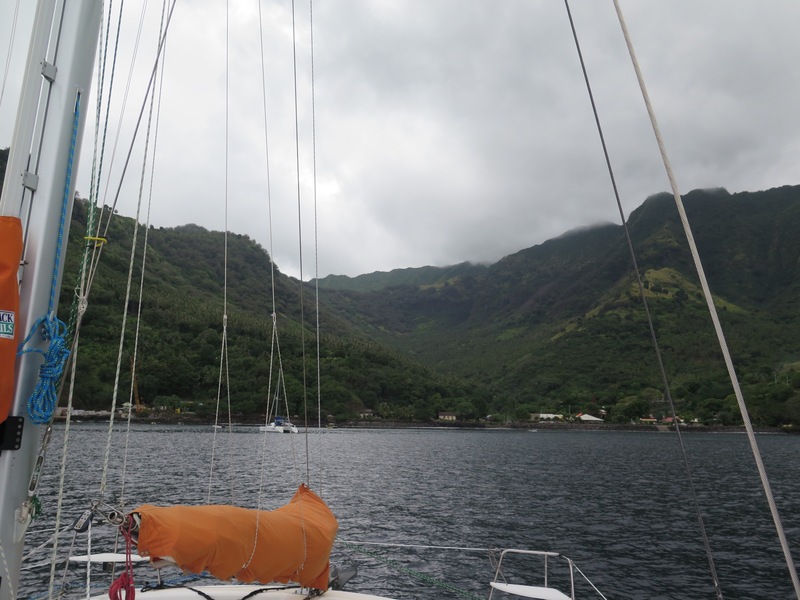 It took three more days for us to raise the anchor and motor two miles south to the village of Vaitahu. We’d hoped to find wifi here but haven’t. Nonetheless we’re glad we moved. As nice as Hanamoenoa Bay is there isn’t much to look at except the sandy beach and palm trees. 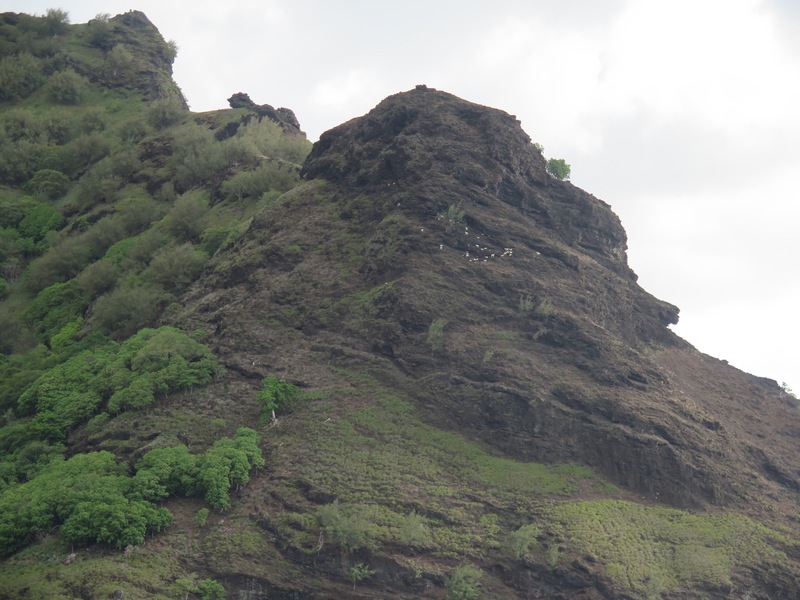 Here there are steep rocky mountains dotted with white goats and village life going on right in front of us just a few hundred yards from the boat. Because of the steep slopes we’re subjected to near constant williwaws, sudden gusts of high winds that race down the mountains and push the boat back and stretch our chain out. We share the anchorage with three other boats and we all seem to be well stuck to the bottom. In the morning we’ll drop the dinghy and go ashore. We hope to find baguettes and some fresh food and maybe some internet. My feet haven’t touched solid ground in quite a while, although Jack swam to the beach in Hanamoenoa once last week. Tomorrow will require both pants and shoes. This little bay is surprisingly significant in the history of the Marquesas. In 1595 the Spanish explorer Álvaro de Mendaña landed here, apparently the first European to do so. Captain James Cook visited almost 80 years later. And in 1842 in this village Admiral Dupetit-Thouars signed the treaty that annexed the Marquesas to France. The tour guide we hired in Hiva Oa had nothing good to say about the French but his beef is with the nuclear testing they carried out in the Tuamotus. John lost several family members from cancer which he attributes to the fallout from those tests. He makes a good point but I don’t think anyone complains about the availability of fresh baguettes and good cheeses.